Products may vary per region, please select your territory using the language selection. Thinking about putting a bathroom in a location where standard plumbing is not available? Look no further! Prestige 50 is an ideal solution for consumers capable of satisfying all of their residential requirements where a WC maybe needed but conventional plumbing is not an option or may not be possible. 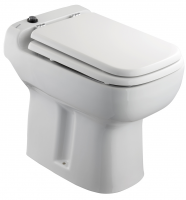 The base unit is a rectangular-shaped modern looking vitreous China & tank-less toilet with a bowl discharge compartment accompanied by a built in ceramic siphon which creates a water trap for easy flush capabilities. Suitable for a variety of commercial and residential applications, Prestige 45’s ease of use and concealed macerating system keep a standard system out of the line of sight for aesthetic reasons and also reduces the unnecessary occupancy of valuable space.